Get twice the value with our wholesale eCommerce package. You'll be able to sell both wholesale and retail, while managing just one catalog. 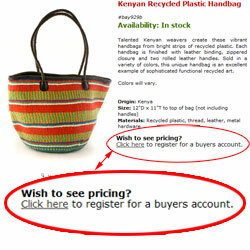 Or, simply showcase your products to the public and accept orders in a password-protected area of your site. Set variable pricing for wholesale and retail customers. Allow retail customers to find nearby retail outlets and accept dealer applications. And much, much more. We create a custom design including a professional graphic look tailored to match your current business materials or desired business presentation. We’ll work with you to organize your site content, develop custom product display layouts, create clear navigation and compelling up-sell and cross-sell messaging. Show us how you want to price your products and we’ll likely say “yes, we can do that!”. Wholesalers frequently want to offer bulk discounts, bulk discounts triggered when certain thresholds are met in a single order, across the board discounts at different levels for different customers, different price lists for different customers, add-on items or options, or complex pricing options that apply to hundreds of products. We can handle just about anything and we make it easy for you to manage your catalog and price your items the way you want to. 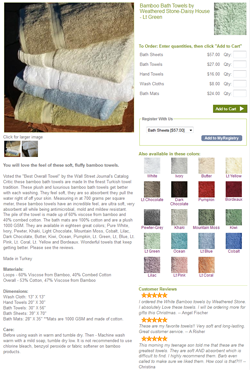 Custom Product layout designed to optimize the shopping experience for your product line. When it comes to online shopping, one size does not fit all. Effectively selling apparel online requires a completely different presentation than what is optimal for selling electrical supplies. We’ll evaluate your product line and develop a shopping interface designed to increase convenience for your customers, to convert more visitors to buyers, and to increase your average order size and total number of orders. You may want to offer your products to the public for purchase, or simply showcase some or all of your items to the public, while allowing only approved dealers to buy. With our wholesale ecommerce platform you will have a single simple interface, that allows you to control which of your products can be seen or purchased by the public, price your products for different groups of shoppers, and manage and control dealer only products, content and messaging. 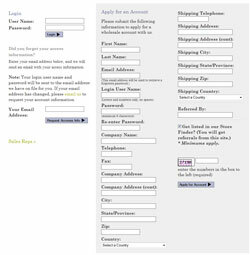 Visitors to your site can apply to become dealers by filling out a form on your web site. We’ll customize the form to collect the information you need. You’ll receive email notification and can approve the account with one click so your dealer can begin buying on your web site at wholesale prices. If your products are available at retail outlets, help your customers find a local source with an easy search. Facebook, Twitter and other media 'like' and sharing buttons on every page. Choose from one of our email marketing partners (Constant Contact, MailChimp, CoolerEmail, or Vertical Response) and we’ll integrate email marketing signup forms on your web site. To learn more about how HEROweb & MightyMerchant can benefit your wholesale business Request a Free Quote. We'll evaluate your needs, share our ideas on how to make the web work for you, and tell you more about features in MightyMerchant that are specifically designed to meet the needs of businesses that sell only wholesale or both wholesale and retail. We have put together a full featured web development solution specifically geared to wholesalers, manufacturers, and distributors who want to sell to both wholesale & retail customers online.